Hi! Happy Wednesday! Wednesday's are actually never happy, I was totally lying to you just then. It's the middle of the week so it's like the red-headed stepchild or something. But Shamrock Shakes from McDonald's makes it a little better. Also polish... cause polish makes every day much better. I've been dying to share this collection with you guys for over a week now. Damn my day job and video games getting in the way! Anyways, today I have some extremely cute polishes to share from Sincerely Polish. Sincerely Polish is an indie polish line that is cruelty free, vegan, and also five-free (which means no DBP, Toluene, Formaldehyde, Formaldehyde Resin, and Camphor). The collection I have to share with you guys is called the Magical Friendship Collection! Hold on to your seats cause we're about to experience a glitter explosion! First up we have Love Always Minnie, a clear glitter topper filled with pink and white Minnie shaped glitters as the main focus. Other glitters in this explosion are white and pink hexes, pink hearts, and light pink bows. Swatched over a base using Covergirl: Natural Blush, used two coats of the dabbing method, and sealed with a fast-drying topcoat. Applying this glitter explosion looks like it might have been a big deal but it was actually really easy. I really appreciate the suspension used in the formula of this polish (and the others as well) because it made all those cute big glitters come out of the bottle with ease. Definitely no fishing. Side note: My camera was not responding very well so I apologize for the less than stellar photo quality. Next up we have Dashing Donald, a clear based glitter topper filled with yellow and white stars, blue and light blue and navy blue large hexes. It also contained some white hearts and micro blue hex glitters. Swatched over a base of Baby Blue by Nicole OPI, used two coats of the dabbing method, and sealed with a fast drying topcoat. 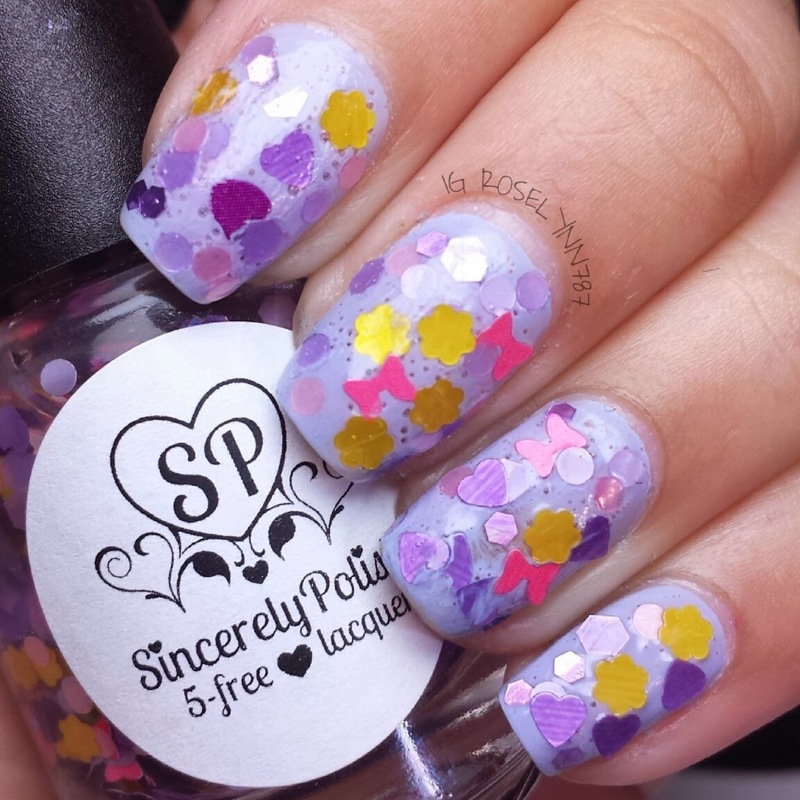 Such an eye-popping glitter combo! No glitter fishing, but will require the dabbing method for application. Minimal glitter placement was done for the swatch. 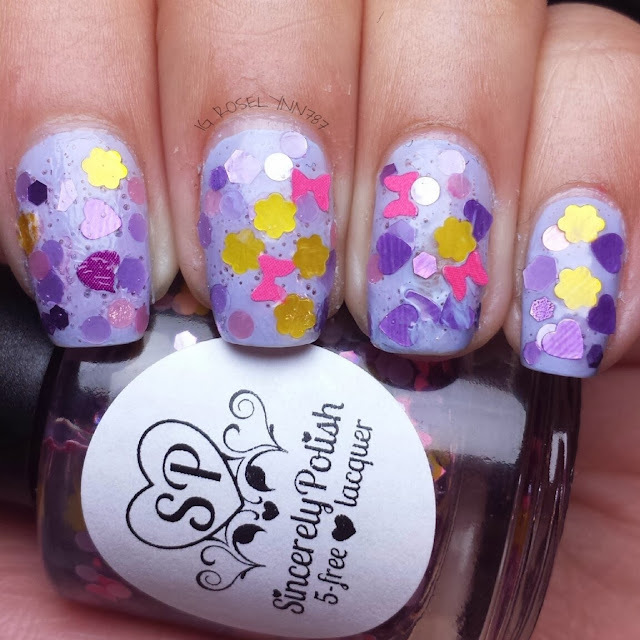 Next is Darling Daisy, a clear based glitter topper filled with yellow daisy flowers, light purple and purple hearts, and pink bows. Also in the mixture you'll find white and light purple hexes and smaller peach hexes. Swatched over Harmonious Mess by OPI, used three coats of the dabbing method, and sealed with a fast drying topcoat. The daisy glitters are without a doubt adorable and just perfect to represent the lovely Daisy herself quite nicely. I went for a more of a random dabbing method here, no purposeful placement. Again, no actual fishing required since all the lovely glitters come out quite easily from the bottle. And finally we have Dear Mickey, a clear based glitter topper filled with red and black Mickey shaped glitters. You'll also find white and red stars, yellow hexes, and small black dots. Swatched over I Just Can't Cope-acabana by OPI, used two coats of the dabbing method, and sealed with a fast drying topcoat. This one is definitely my favorite from the whole collection and a must have for polish lovers. The color combination is perfection and I absolutely love how this looks on a yellow base. I did the dabbing method along with some glitter placement for the swatch. Just like the rest, this has a great suspension base and didn't make me go fishing. 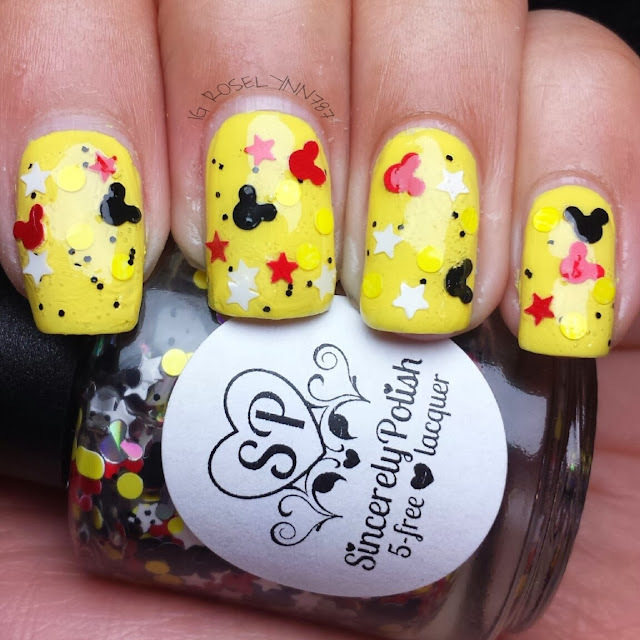 This collection of glitter toppers is definitely memorable and makes me think of all my favorite Disney characters. Karen was able to easily capture their essence in each color and glitter combination. Overall I'm happy to have these beauties in my collection. I think you guys will definitely enjoy them, as long as you know what you're doing and know how to apply them properly. Each one will require a base color and you will need to apply the glitters with the dabbing method. No way around that. The dabbing method is super easy to do. I don't have a post on it yet, but you can see a YouTube video on how to do it here http://www.youtube.com/watch?v=2_uNNVx4x6g. I personally found that a bit of placement along with dabbing worked best for me. Another thing to take note is that I did leave every single one of these upside down for 24 hours prior to use. You don't have to leave them that long, usually 5-10 minutes is enough but I went for the extra mile. 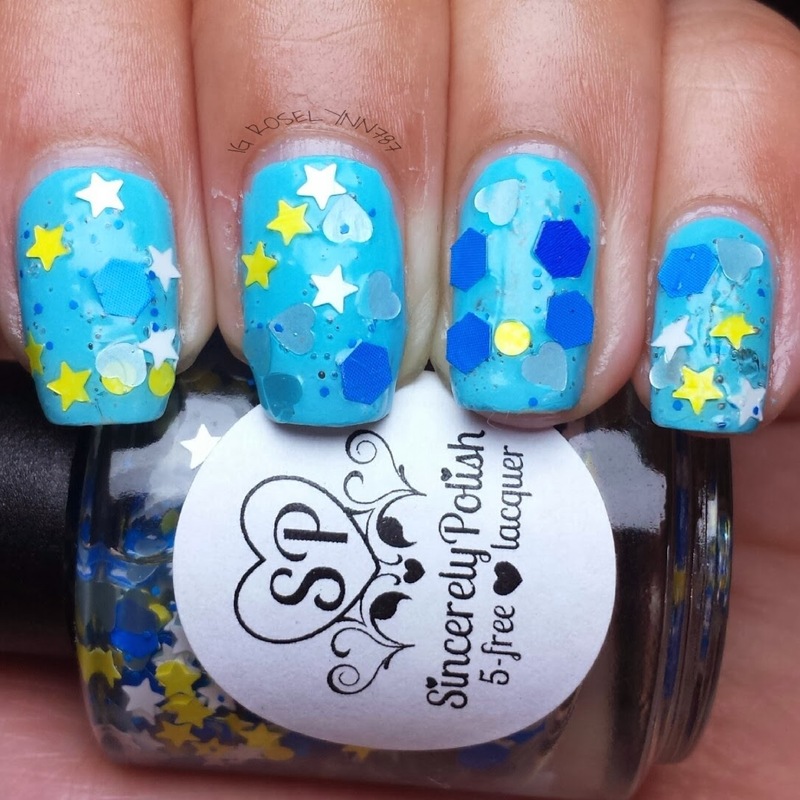 You can check out this beautiful collection along with many others at Sincerely Polish's store: http://sincerelypolish.storenvy.com/. 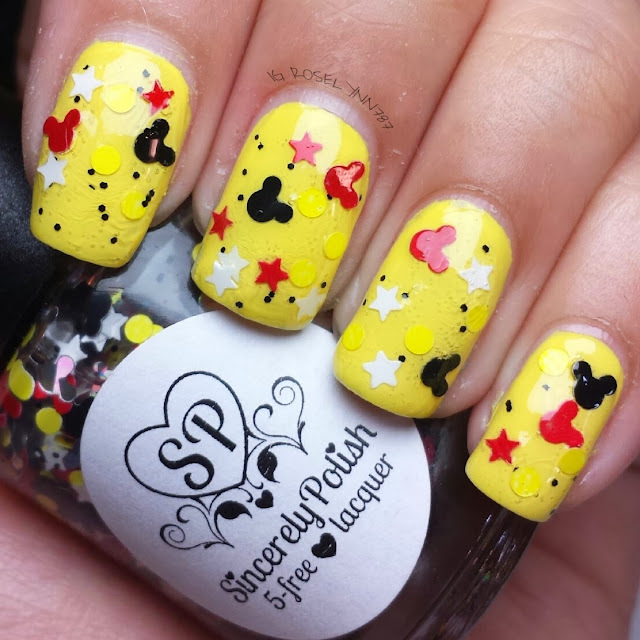 Also be sure to follow Karen on Instagram to have the latest information on release dates and special offers: http://instagram.com/sincerelypolish. Thank you for stopping by hun. I love how most indies are so safe in their usage. Makes it that much more important we support these small businesses. Those are adorable. Donald and Mickey are my favorites! Thank you :D Those two are my favorite as well! Thank you sweetie. It was definitely a very cute collection to swatch. These are perfect!!! I love how all the colors come together and am obsessed with glitter. I am from the Brightside Beauty Hop. the Mickey Mouse ones are so adorable! 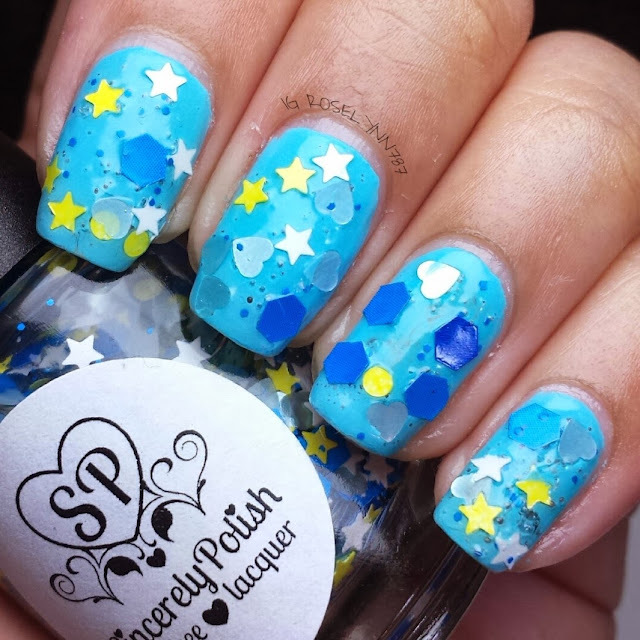 I have a slight obsession with confetti in polish, and I am definitely going to give darling daisy a try!!! New to the blogging world and found you on the bloghop. A follow would mean so much!